Since Initiative 71 called for the decriminalization of recreational marijuana in November 2014, DC is looking more and more like the “District of Cannabis” each and every day. With the ease of gifting up to a zip of “free” bud to anyone under the sun in our nation’s capital, hundreds of new “pop-up” weed vendors are jumping through legal loopholes to turn what used to be a hushed exchange amongst friends into an emerging “legitimate” yet completely unregulated market. Being a Northern Virginia native with a curiosity to witness these ganjapreneurs firsthand, I made the trip up to the “District of Cannabis” with high hopes of documenting this phenomenon. I was on a mission to understand exactly how these “businesses” operated within the gray area of the law and to explore all of the new ways in which weed culture is pushing the frontier of entrepreneurial discovery in Washington, DC. From a dab bar to talking with delivery drivers, and taste testing all the different weed-infused concoctions in between, I can personally say for all you Richmonauts still chiefing b-grade mulch in your basements, the grass is definitely greener on the other side. 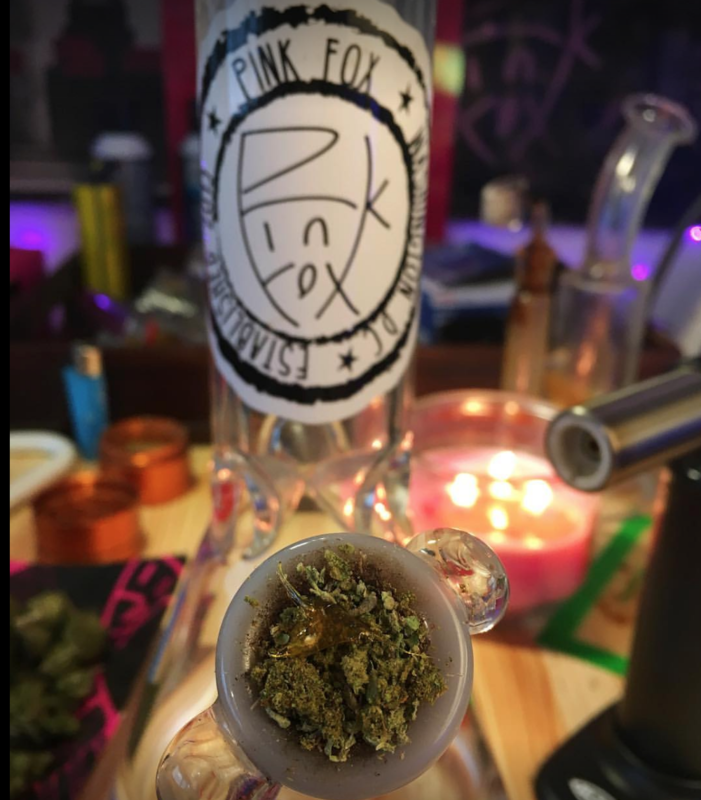 I started off my day at the PinkFox headquarters where I met with co-founder Mark Nagib, to talk about their role in the cannabis support movement over a bowl or two, or three. “Both my business partner Kelly and I were laid off on the same day in 2015, we both poured our severance into this and after I started getting into art, we were lucky enough to see this lifestyle brand grow faster than we could have ever expected,” he said. 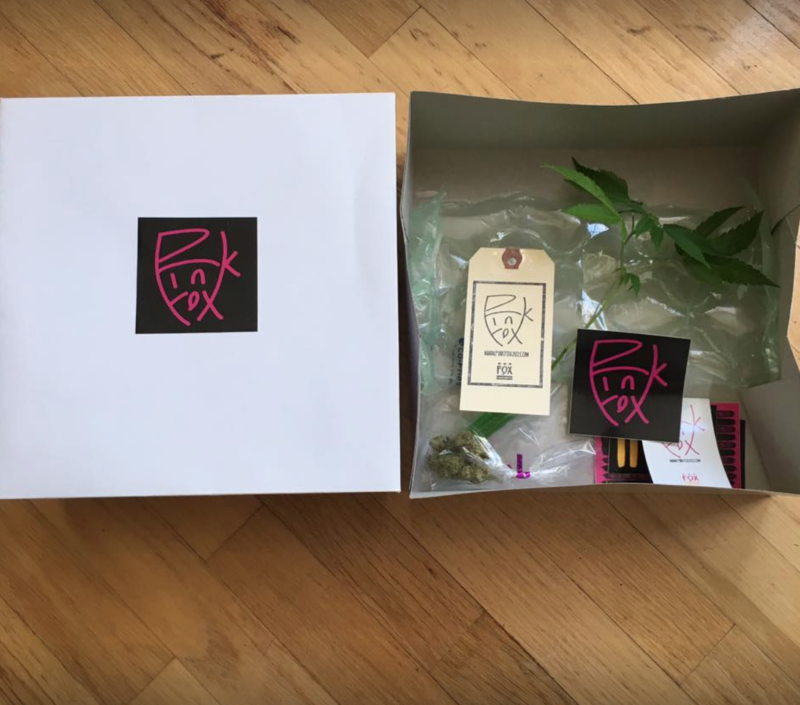 Obviously, the pair does not sell cannabis, which they could not stress enough on their website, but they do “gift” it along with the purchase of merchandise whether it be a t-shirt, hat, backpack, or posters with their pink fox logo on it. “We all tell ourselves that the cat is out of the bag, but not everyone is prepared to wear clothing that represents blatant marijuana support, so creating a lifestyle brand for those who are ready for the substance but want some discretion to go along with it was a no-brainer for us. That’s why we started the brand, people being denied something they’ve wanted, and now being given access to it,” said Mark. But it’s their baked goods that really have the people clamoring. Kelly is the master chef behind it all. 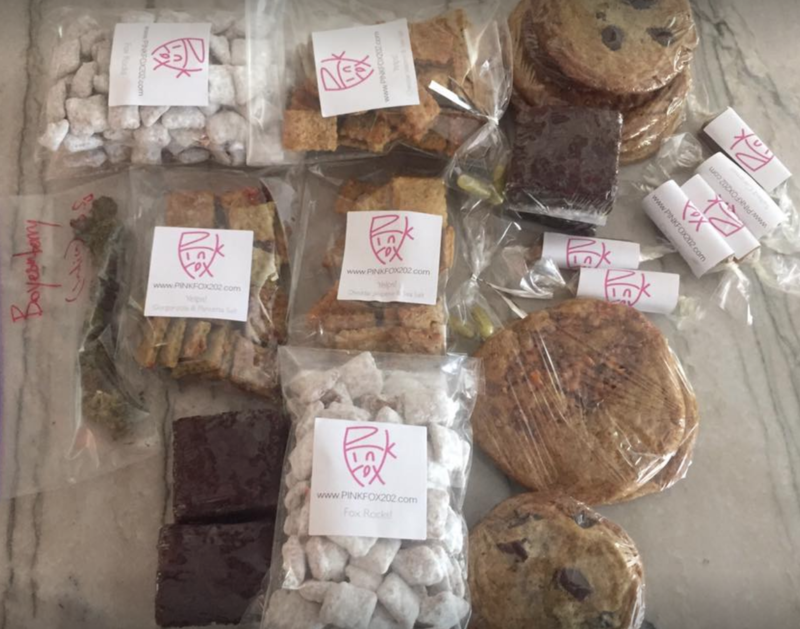 Pink Fox specialize in edibles, such as their famous gorgonzola and pancetta “Cheese-itz”, but have recently expanded their menu to incorporate pop tarts, salted caramel brownie bites, “cannabutter”, watermelon candies, and peppermint butter and chocolate chip cookies. Because DC is not a state, and approximately 30 percent federal property, it doesn’t have the same rights as far as the autonomy of its budgeting goes. Legislation opposed having money come in from the taxation of a federally banned substance, ultimately leaving the District where it is today with Initiate 71. There aren’t any recreational dispensaries, and unlike states like Colorado, you can’t just walk into a store and buy a joint. “Up until recently there were four medical dispensaries in DC, one in each quadrant, and you could only commit to one which means if they are out, you are screwed,” said Mark. Pink Fox set up a booth at the National Cannabis Festival and Tee Con, but those looking to buy some merchandise have to make an appointment. With a giant flat screen tv displaying more game consoles than I could count, an entire kitchen full of edibles, and an armory of bongs ranging in all shapes and sizes, its a stoner’s dream unto itself, but clients are not allowed into Pink Fox HQ, and rather have to arrange to meet in a public place to get their goods. The prices are suggested donations in exchange for the swag. The person buying sets the donation price for a t-shirt or poster, sticker, et cetera, which is given with the edible of their choosing. And while I could munch on their gorgonzola “Cheeze Its” all day, I knew I would be stuck there if I didn’t split, so I said my goodbyes and went on with my cannabis cruise to discover what a true pop-up vendor event was really like. With a bottle of Rohtos in my pocket and expectations high as a kite, I was headed to my first ever event “Tasty Tuesdays”, held at DC’s Listen Vision Recording Studios. I was on the hunt for the infamous 200 mg-infused cheese pizza slice I had been hearing about and wouldn’t stop until my palate was satisfied. I followed the all too familiar aroma until I rolled up to the studio porch to see a DJ blasting the latest rap hits into the street. Inside, I was met with a semi-crowded room, more so due to the size of the room than the number of people there, and about five or six vendors working at the time. Upon entrance, I was handed a dab pen of distillate to test out. I had no idea where to begin, or how to act exactly, so I did what anybody else would do, and followed the free samples. 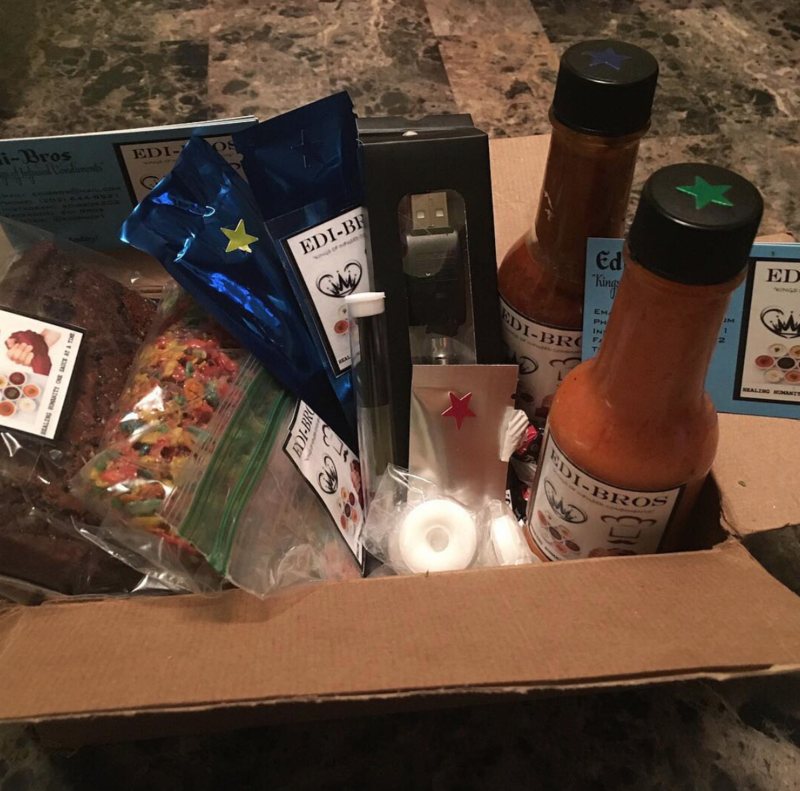 It seems most people are using the “donation” loophole as a way to still make a pretty penny off their home-cooked edibles and pre-rolls. Pretty much what I got out of it was, “Do not ask how much, and make sure you pick up a sticker or business card before you leave.” Other than that, it seemed pretty straightforward. 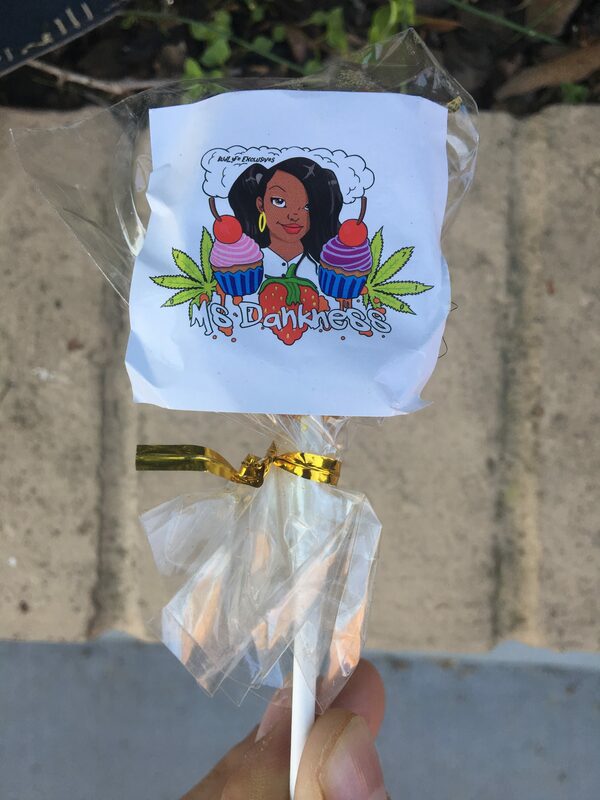 Mrs. Dankness had been averaging about two events a week and had everything from nugs and cookies to lollipops and gummies. I went with a 150mg mega gumdrop and a couple cookies that I had planned to secretly leave for my parents when I went back to school. Peanut butter for my dad, and chocolate for my mom, in exchange for what I remember being a $20 donation, but then again, I could barely remember my name halfway into the event. I slothed my way over to Not Ur Granny’s Adults Treats, who specializes in gourmet edibles for adults. Run by owner Bae Baker, N.U.G.S., (get it? ), is surprisingly located in Baltimore, Maryland which I thought was interesting. They had a beautiful array of different elegant personal sized chocolate and vanilla cakes, infused with over 250mg of THC. 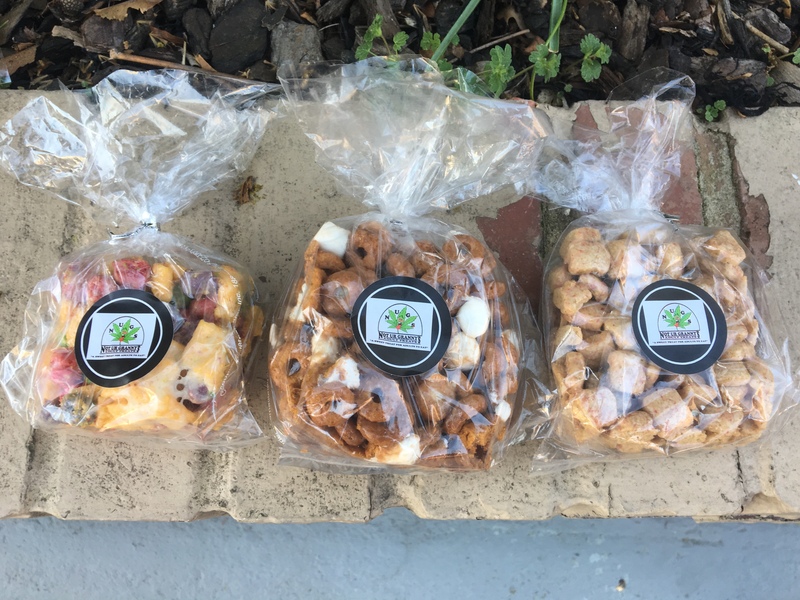 What really caught my eye were the rice crispy treats, made with either Cap’n Crunch or Cinnamon Toast Crunch mixed with marshmallows and cut into squares, each averaging about 80-90 mg of THC which I, of course, had to have to start my collection of souvenirs. I’m not into all the hocus-pocus of different strains and percentages of Indica and Sativa. If it does the job and is cheap, I’m game, so I couldn’t fully appreciate the fact that I was puffing on a GG#44 and Sunset Sherbert Hybrid pre-roll that I snagged off this guy for $10 from the next table. It was interesting to me how some of the vendors are very strict with the rules, bringing only an ounce or two of flour, ensuring that it is gifted in return for a monetary donation, and others who aren’t, simply waving joints in your face asking for $10. I was somewhat skeptical after seeing the THC percentage for each edible was a range, to calculate for some sort of measurement error or something. I guess because it’s all still unregulated, you can still get gipped and sold mids without repercussion, the only thing now is that you have the reputation of a brand to upkeep. It’s all about customer loyalty in this industry because it’s almost too easy to get it from somewhere else at this point. Picture a really crappy restaurant barely running off the service of tourists, if you don’t have people ever coming back to eat at your restaurant again, it is going to be a lot harder to remain afloat. I was most definitely one of the tourists, already burning through more than half of my budget before lunch, and we hadn’t even gone to the next event yet. Next up on the itinerary was Twisted Up Tuesdays, hosted by Out The Park Concessions DC, who I found on Instagram. That is usually how you find out about events around here other than simply typing in “Marijuana events in DC”. For this event specifically, I had to order a free ticket off Eventbrite that came with a corresponding email to contact for the address, I guess better safe than sorry. My photographer and I arrived at a townhouse on the corner of a typical suburban neighborhood, slightly confused if we were in the right place. The moment the front door opened, the smell reassured us. I was greeted by a hefty bouncer in a wife-beater, who most definitely owned a motorcycle and ate nails for breakfast. He patted us down, unfortunately, saw the cameras, and told us to leave our equipment in the car. After returning, we headed on upstairs, realizing we had come just in time for whatever “Flower Power Hour” was. Now this place was the real deal, ran out of someone’s home rather than a rented out venue or office, an open two-level townhouse with giant ceilings and a couple dozen vendors definitely gave more of an inviting feeling than the recording studio. The lights were turned off for the most part, but each vendor had a lamp overlooking their table, adding to the trippy atmosphere. The High Definition Society table displayed their G3 Xtracts concentrate bar, and for $5 stickers, each coming with a dab of your choice, they were being ripped through like shots at happy hour. 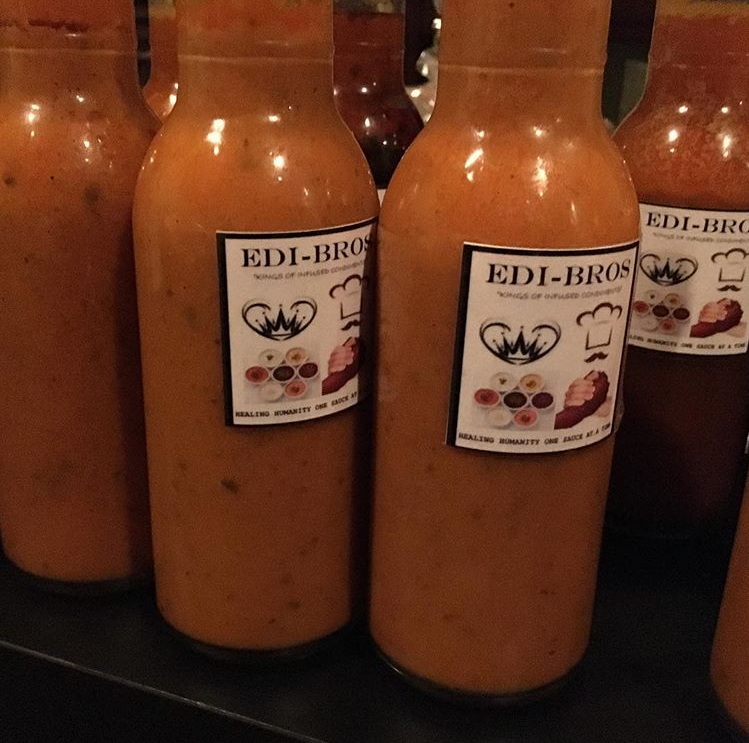 I was then introduced to the Edi Bros., who specialize in THC-infused condiments. They offer them both infused and uninfused, for a donation of course. With a collection of over eight different sauces, they really pride themselves on their best-selling Buffahigh and Mumba-Que sauce. For those of you that aren’t familiar with Mumbo sauce, it is a famous DC delicacy found in many takeout restaurants, similar to that of a sweet barbecue I would say, but I’m no local. A big bottle will yield you about 350 mg of THC, and the little guys have around 200. I tried some with chips as we talked about their journey to where they are today. The two founders are from Buffalo, New York and Washington DC. Requesting to stay anonymous, they credit marijuana for saving their lives and want to spread the good word of the benefits they have experienced, one admitting that weed had got him off anxiety medication and helped him with depression and ultimately losing 100 pounds. Everything about their patent-pending sauces is done in-house, nothing is shipped in. They say the key is a properly decarboxylated oven. They only started going to events about five months ago, but said their Instagram is growing daily. “We are not high end, we are not niche, we aim to be renaissance men within the cannabis community,” they said. 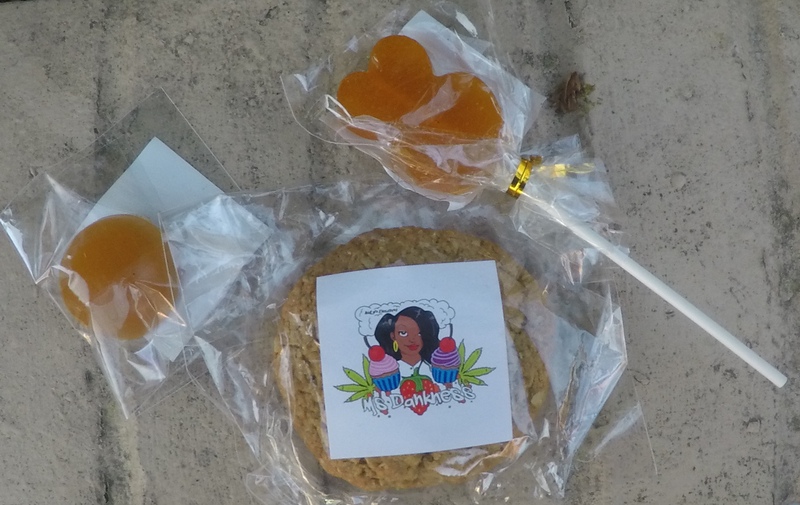 Edi Bros. also has your typical infused baked goods, as well as candy that you can pick up for any sort of donation. They say that their oil gel pills have been increasingly popular with older people in the workforce that see smoking as an inconvenience. I didn’t end up buying any sauce, I was more fascinated by the strawberry kiwi moon rocks and infused watermelon sour patch candies at the next table. I had about $30 left in my budget and needed to leave with some good old, normal, regular, weed. I struck up a conversation with CMEkushkings, a Richmond native. As we got to talking, he said he lived in Short Pump and was working at CoStar making $60,000 a year. He moved up to DC just a couple months ago to take advantage of the green rush and said he is already projected to make more than that next year. He graciously gifted me a free eighth of Gelato in exchange for purchasing one of the stickers he had laid out on the table for my $30. I had burned all of the cash in my pockets, and half of the cells in my brain, but I successfully completed my cannabis cruise with a full bag of goodies and a smile that would be involuntarily stuck on my face for the next hour or so. Now I would have had better pictures for you guys, but I sort of ate most of the product before coming back to work. But regardless, we learned that because this business is unregulated, you may now know exactly what you are getting, but not exactly how much you are getting in terms of dosage. We learned that there is definitely a number of legal loopholes these vendors are jumping through “under the radar” to survive, and we know that the recreational marijuana scene in Washington DC is on the rise, almost completely eliminating the need for a medical license, and pushing the frontiers of weed culture in the nation. And if you want to know whether or not it was worth it all, let’s just say this article alone has taken me the longest out of any thus far, the inside of my mouth is drier than the Sahara, and I have become a part of the very couch I took refuge on after finishing what is left of my goodie bag of souvenirs.